With the winter weather upon us, keep warm and check out 3 new apps in our December App Share. Let us know if you’ve used any and what you thought of them. Please share your favourite apps with us on our Facebook or Twitter and visit App Share to see more of ours! What is it? Sound Rebound is an offbeat experience of colour and sound that invites you to create ricochets, bounces, or bumps to investigate seeing and hearing. Sound Rebound is a creative space for you to build mesmerizing interactions, dynamic collages, or whatever comes to mind. Orchestrate bounces and bumps and explore the colour of sound. Requires headphones. Why do we love it? This app is a delight for engineers and explorers alike! The play screen becomes a musical pinball constructed from bars, curves, squares and diamonds. Each shape can be easily resized, rotated, deleted or caused to spin or rock by adding a pin through its centre. 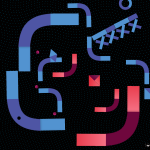 Drop a ball (or many) to animate your construction and hear it play. Easy to learn. Surprisingly difficult to put down. What is it? 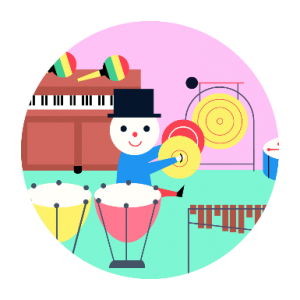 Tongo Music is a fun, engaging educational app about music for kids and the whole family. It is produced by experienced music teachers and illustrators. Explore a colourful landscape with animals and a fun character (Tongo), and follow short animated stories about instruments, notes and audio samples. Voted Best of 2016 (AppStore) and received Parents’ Choice Gold Award 2017. No ads, and no in-app purchases. Limited interactivity. Why do we love it? A relaxed music experience of simple colourful animations combined with good quality audio recordings of individual instruments (including violin, cello, trumpet, bass, guitar, flute) and extracts from pieces by Mozart, Beethoven, Bach, Haydn and Tchaikovsky. Also includes an Interactive piano and percussion instruments. What is it? SoundForest is a mini music maker that allows you to instantly compose a song using a collection of musical creatures. Compose a loop by tapping animal instruments and mix them into a hypnotic tune. 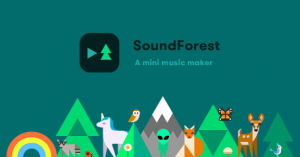 Make a musical ecosystem with SoundForest. Why do we love it? SoundForest is a refreshing alternative to the conventional look of pattern sequencing. Although a metronomic grid lurks in the undergrowth of the forest, it seems more organic than that when playing. 4 different musical environments with 160 musical elements are available but you will have to spend £1.99 to unlock everything. It’s worth investing if this is an App that you are enjoying spending time with. Headphones required.